A calendar of protests, discussions and other events that aim to improve the world. Updated Nov. 19, 2016. To submit events to the list, email details and links here. I’ll be updating as I hear of additional events–and as my schedule allows. Note: Event times and places sometimes change. Please follow the links to confirm details. Also I am unable to vet all of these events. And some trolls have been announcing fake events. Be careful. 10:30 a.m. “Pack the Court—Dismiss the Cases.” Families For Justice As Healing is demanding that “the Commonwealth dismiss the 24,361 drug cases that relied on tainted evidence! … Please join us to pack the court and show that the community supports dismissing these cases and holding prosecutors accountable.” At the Massachusetts Supreme Judicial Court, 1 Pemberton Sq, Boston. 12:30 p.m. “Stand in Solidarity: A Rally for Peace and Solidarity.” In response to two Babson College students driving through Wellesley College waving a Trump flag the day after the election, Wellesley College students have organized a walk and peace rally to confirm their solidarity with students at Babson College and Olin College. Rally on the Wellesley campus. March to Morton Park. 6 p.m. “Post-Election Action Meeting for Reproductive Freedom.” NARAL Pro-Choice Massachusetts holds a meeting to discuss plans to “ensure reproductive freedom for all Bay Staters.” At Workbar Cambridge, 45 Prospect St., Cambridge. 6:30 p.m. “What Next?” A discussion hosted by Bernie North Shore on “Where does the progressive movement go from here?” At Morency Manor Community Room, 45 St. Peter St., Salem, Massachusetts. 6:30 p.m. “The Port Cafe: Nourishment (Ourselves and our Community).” The November meal from the group which describes itself as “an intentional gathering of diverse people to break bread together. We believe that most effective and natural way to create community is over shared food.” This event’s “theme is ‘Nourishment’ for ourselves and our community, as we come together during the season of feasts and family.” At Community Art Center, 119 Windsor St., Cambridge. 7 p.m. “CDCC Post-Election Meeting.” The Cambridge Democratic City Committee hosts a discussion of the recent election. At Spaulding Cambridge, 1575 Cambridge St., Cambridge. 3 p.m. “UMass Boston Anti-Trump Agenda Organizing Meeting.” At UMass Boston. 5:30 p.m. “Community Conversation in Lynn.” Hosted by 1199SEIU Massachusetts at Lynn Museum/LynnArts. 6:30 p.m. “Just Consumption: Spending with Integrity.” A panel discussion on buying more justly. Hosted by Boston Faith & Justice Network at Church of the Covenant, Boston. 7 p.m. “Fight for $15 Art Build at MassArt.” For Nov. 29 “national strike … demanding a living wage for all workers.” Hosted by Phenom (Public Higher Education Network Of Massachusetts) MassArt at MassArt, Boston. 7 p.m. “Origins of the Police, part 6.” Mass. Action Against Police Brutality hosts a talk on the history of American policing from the end of World War II to the beginnings of the Civil Rights Movement. At 391 Dudley St., Roxbury. 7 p.m. “Students Against Trump.” Northeastern University Students Against Institutional Discrimination protest the election of Donald Trump. At the Boston school’s Centennial Common. 7:30 p.m. “Together We Can, Erase the Stigma.” Forum on opioid addiction and recovery. At Watertown Middle School. 6:30 p.m. “Post-Election Shabes Potluck: We Will Build This World With Love.” Hosted by Boston Workmen’s Circle Center for Jewish Culture and Social Justice in Brookline. 7 p.m. “Support President Trump” rally. Maybe at Boston Common. A pro-trump troll using the pseudonym “Mick Hewlitt” first announced that would be a “Not My President” rally: “We will take to the streets in an intimidating show of force. We will smash the fascists….” But anti-Trump folks called the event a hoax. The event title was subsequently changed to “Support President Trump.” Who knows if it will actually happen? 7 p.m. “What Happened to the Arab Spring?” A discussion featuring Gilbert Achcar and Yasser Munif. Hosted International Socialist Organization – Boston at Haymarket People’s Fund, 42 Seaverns Ave, Jamaica Plain. 7 p.m. “After #DumpsterFire2016—‘What’s Left?’” A discussion of “how humanity can move forward” after the presidential election. At Center for Marxist Education, 550 Massachusetts Ave., Cambridge. 7:30 p.m. “Subway Therapy Cambridge—Share your Post-Election Message.” Inspired by a post-election action in New York, the organizers invite people to write notes and post them on the walls of the Harvard Square red line MBTA stop in Cambridge. 10 a.m. EUUNI (Empowering, Uplifting, Uniting, Networking and Inspiring) “will be giving out blankets and winter accessories first come first serve.” At Boston Common. 10 a.m. Boston Mayor Martin J. Walsh hosts a public discussion “about racism in Boston, and how we acknowledge our past as we look to our future in order to become a more socially cohesive and resilient city.” Note: Event is full, but will be live-streamed. At Cutler Majestic Theatre, 219 Tremont St., Boston. 11:30 a.m. “Remembering Hussain ibn Ali (AS) – Arbaeen Walk – Boston 2016.” A group gathers for poetry and speeches to commemorate Hussain ibn Ali, “a revolutionary figure who stood up for the truth in the face of corruption & tyranny and whose sacrifice nearly 1400 years ago continues to inspire.” At Copley Square, Boston. Noon. “BLAA’s World AIDS Day Painting Session for 25th Medicine Wheel.” The Boston LGBTQIA Artist Alliance invites people to paint panels at a studio at 30 Germania St, Boston, for display in the 25th annual Medicine Wheel Vigil at the Boston Center for the Arts on Dec. 1, which honors those affected by HIV/AIDS. 1 p.m. “Conversación Communitaria – 2016 Elections.” SEIU Community Action hosts “a community conversation about the 2016 Elections and where we go from here.” At 9 Lawrence St., Lawrence, Mass. 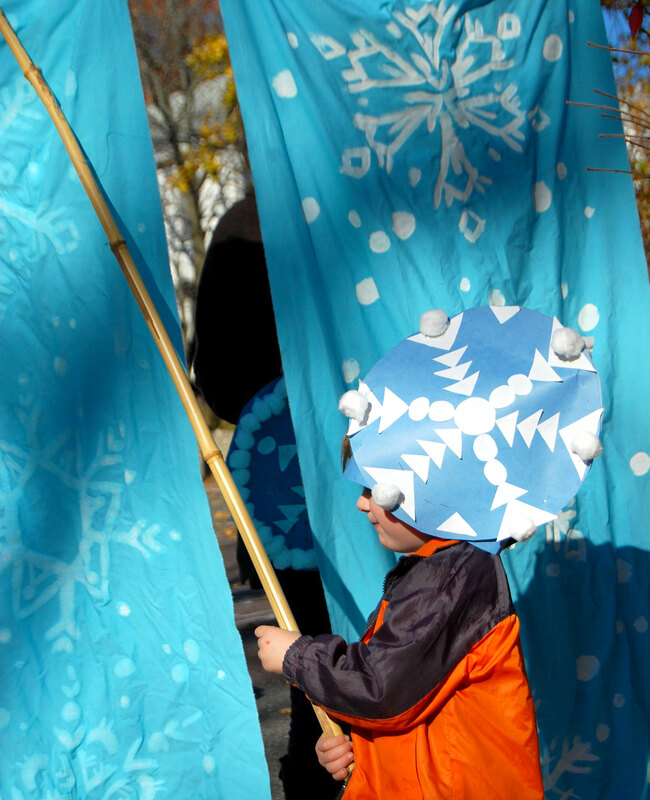 2 p.m. “Snowflake-hat making: Free kids craft workshop.” Artists Kari Percival and Greg Cook host a free, public craft workshop for kids and families to make big paper snowflake hats–to wear in their group “Let It Snow / Santas Against Global Warming” that will be walking in Malden’s Parade of Holiday Traditions on Nov. 26. Craft at the Malden Public Library, 36 Salem St., Malden, from 2 to 3 p.m. Saturday, Nov. 19, 2016. 2 p.m. “Trans Day of Remembrance at Northeastern University.” The The LGBTQA Resource Center at Northeastern University hosts a panel discussing “lives of the transgender community lost to violence.” At the school’s John D. O’Bryant African-American Institute, 40 Leon St., Boston. 2 p.m. “Election 2016: Where Do We Go From Here? Public Meeting.” Socialist Alternative Rhode Island discusses the results of the 2016 election and “where our social movements must go from here.” At Rochambeau Children’s Library, 708 Hope Street, Providence. 3 p.m. The North American Indian Center of Boston and Native American LifeLines host a free “Community Feast.” At the center, 105 South Huntington Ave., Jamaica Plain. 3 p.m. “Manchester’s next step in resisting Trump! Public meeting!” Hosted by Socialist Alternative Lowell/N.H. At Plumbers and Steamfitters Local 131, 161 Londonderry Turnpike, Hooksett, New Hampshire. 4 p.m. “Vision for Black Lives: End the War on Black People.” Part of a series of workshops exploring the Movement for Black Lives policy platform released in August. At The Humanist Hub, 30 JFK St., 4th Floor, Cambridge. 5 p.m. “Remember and Restore: Celebrating our Loved Ones & Our Strengths For Trans Day of Remembrance / Resilience.” Pleasure Pie and The Meeting Point host an event to “honor, revel, and love all of the spectacular beings in our community through art, performance, discussion, and snacks.” At the Meeting Point, 3464 Washington St., Jamaica Plain, Boston. 6 p.m. “The Launch of ‘Vital Little Plans: The Short Works of Jane Jacobs.’” Editors Samuel Zipp and Nathan Storring present and discuss the works of the celebrated urban theorist Jane Jacobs. At Providence’s Ada Books. 6:30 p.m. “Voices Against Injustice by The Liberation Poetry Collective.” The Boston group presents a poetry reading at Out of the Blue Art Gallery and More, 541 Massachusetts Ave., Cambridge. 7 p.m. “Civil Resistance as a Moral Imperative.” Peter Nightingale speaks “about recent scientific findings about climate change and why he believes civil resistance is our last, best hope for averting catastrophe.” At Lily Pads Complex, 27 North Road, Peace Dale, South Kingston, Rhode Island. 7 p.m. “Reception for the BLAA Exhibition trans/draw.” Twelve Boston area artists use “drawing as a mechanism to express and reflect on the trans experience.” At Gallery 263 in Cambridge. Organized by the Boston LGBTQIA Artist Alliance. 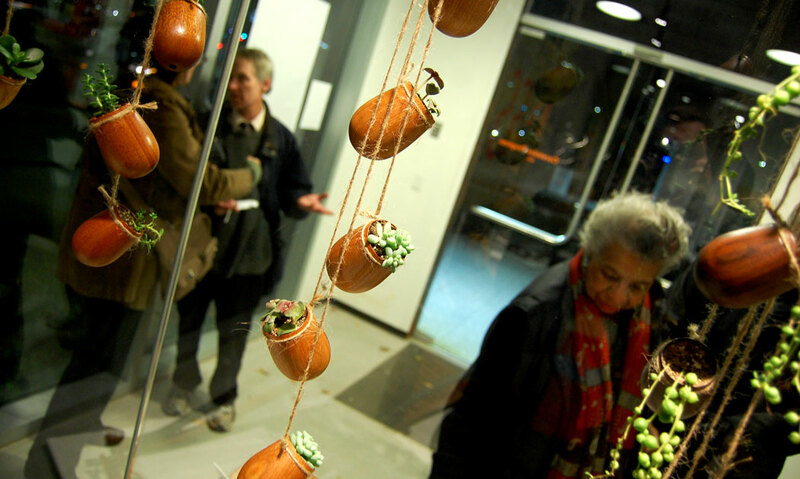 10 a.m. “Volunteer Opp: Work and Design Day.” At the Somerville Community Growing Center, 22 Vinal Ave., Somerville. 10:30 a.m. “Trans March of Resilience 2016: Trans Life is Resistance.” Brown University LGBTQ Center hosts this march to” Celebrate Trans Life.” Begins at Knight Memorial Library in Providence. 11 a.m. “Massachusetts Center for Native American Awareness and Bridgewater State University Pow-Wow.” A Celebration in recognition of National Native American Heritage Month. Organized by Massachusetts Center for Native American Awareness, BSU President’s Office, U.S. Ethnic & Indigenous Studies Program, and the school’s Native American Cultural Association. At Bridgewater State University’s Kelly Gym in Bridgewater, Mass. Noon. “Ride of Remembrance 2016.” A bicycle ride beginning at Boston’s Copley Square to “honor those who have been injured or killed in traffic crashes … and also demand change.” Concludes with a vigil and rally on the steps of the Massachusetts State House. Noon. “Providence Protects the Sacred ~ Stand with Standing Rock.” Crow DogWindow hosts “a Peaceful Gathering in Solidarity with the People of Standing Rock.” At the Roger Williams National Memorial, 282 N. Main St., Providence. 2 p.m. “Love Trumps Hate Rally.” Taylor Griffin is organizing this rally in opposition to Donald Trump. At Boston Common. 4 p.m. “Fighting for our future: A panel on education.” Boston Democratic Socialists of America host a discussion about the “struggle against privatization and corporatization, and for democracy and equality” in public education. At MIT 35-225, 127 Massachusetts Ave., Cambridge. 6 p.m. “Boston Transgender Day of Remembrance.” The annual event “memorializes individuals who have died throughout the world in the previous year because of anti-transgender hatred.” At St. Paul’s Cathedral, 138 Tremont St., Boston. 8 p.m. “El Pique // Political Performance and Reflection.” A free evening for “performance and multimedia artists to present work as a reflection and reaction to our current socio-political environment, our history, and glipses into the future.” At AS220’s 95 Empire black box performance venue, 95 Empire St, Providence. 8 a.m. “Fire Bannon: Boston Jewish Resistance Against Trump.” IfNotNow Boston leads a “march to confront Donald Trump’s appointment of white supremacist Stephen Bannon to Chief Strategist.” Beginning at Boston’s Faneuil Hall Marketplace, next to the New England Holocaust Memorial. 11 a.m. “Massachusetts Speaks out Against Hate.” Anti-Defamation League of New England says: “In the wake of an alarming number of hate and bias fueled incidents across the country and in Massachusetts, we are convening the community on the Massachusetts State House steps to speak out against hate.” At the Massachusetts State House in Boston. Noon. “Tell State Leaders We’re Counting On Them: Resist Hate!” Rhode Island Working Families Party rallies to urge “leaders in state government to issue a firm commitment to use every tool at the state’s disposal to resist the Trump agenda by protecting immigrant communities, defending reproductive rights, supporting working families, and continuing climate action.” At Rhode Island State House in Providence. 5:30 p.m. “A Most Peculiar Institution: Slavery and the American University.” Jonathan Holloway of Yale and Adriane Lentz-Smith of Duke discuss the legacy of slavery in American universities. At the Massachusetts Historical Society, 1154 Boylston St., Boston. 6 p.m. “From Community Outrage to Action: Beyond the Ballot II.” A discussion with a focus on black liberation. At Make Shift Boston, 549 Columbus Ave., Boston. 7 p.m. “Post-Election Healing Yoga.” Free 75-minute restorative yoga class, taught by Brenda Hernandez, “is an opportunity for us to join together to create a safe and compassionate healing space.” At City Pop Egleston, 3195 Washington St., Boston. 7 p.m. “Open Organizing Meeting for the 12/5 Boston Student Walkout.” Student organizers from across the city gather to plan a mass student walk out scheduled for Dec. 5. At Massachusetts College of Art and Design in Boston. 7 p.m. Maine Democratic Socialists meet at Portland City Hall to plan ways to build their chapter. Noon. “Symposium on Art for Cultural Inclusion.” Arts Connect International and UMass Boston are hosting presentations to discuss inclusion and “address the cultural equity gap in our Boston community and beyond, by promoting cross-sector and multi-disciplinary approaches to building and supporting inclusive communities.” At UMass Boston’s Campus Center. 6:30 p.m. “Creating Together Lecture Series: The Human Issue of Immigration.” Hera Gallery in Wakefield, Rhode Island, hosts a talk by Michael T. Doyle, executive director of the Immigration Advocacy and Support Center in New London, Connecticut. Antonia Amprino, author of “Words of Fire: Women Loving Women in Latin America.” At Community Church of Boston. 8:30 p.m. “Feminist Art Wednesday: ‘Friendsgiving.’” Feminists of Salem host performers, poets, musicians, crafters and artists at Koto Asian Grill, 90 Washington St., Salem, Massachusetts. 9 a.m. “Jamaica Pond Solidarity Stroll.” A group going by the name We Stand Together Boston invites people to “join together in the morning to walk around our beautiful Pond in solidartity against hate and violence.” At Jamaica Pond, Boston. 5 p.m. The Museum Independent Security Union, representing guards at Boston’s Museum of Fine Arts, protests on Huntington Avenue, out front of the institution, as part of its ongoing contract fight with the museum. 7 p.m. “Night of Remembrance and Light.” Anna’s Pals, non-profit supporting hospitalized children and their families, aims to “wrap [Boston’s Jamaica] Pond in candle light. We will line the pond and light our candles one by one until the circle is complete.” Including singing by a student chorus and hot chocolate. 3 p.m. “Black&Pink Downtown Volunteer Drop-In.” Black & Pink—“an open family of LGBTQ prisoners and ‘free world’ allies who support each other” and “work toward the abolition of the prison industrial complex”—writes correspondence to “our incarcerated family.” At Encuentro 5, 9A Hamilton Place, Boston. 8 p.m. “You Don’t Have To Live Like A Refugee vol.1.” Benefit show for The International Refugee Assistance Project. At Aurora in Providence. Noon. “International Day of Solidarity with Palestine.” The Boston Coalition for Palestinian Rights, the Alliance for Water Justice in Palestine and United for Justice with Peace invite them to this “stand out” at the Downtown Crossing MBTA station in Boston. 2 p.m. “2016 Gold Star Families Tree Dedication & Holiday Reception.” The tree at the Massachusetts State House “pays tribute to all Massachusetts Service Members who gave their lives in service to our Nation and the families who carry their legacy forward. Photos and messages from loved ones will be displayed on the tree.” Santa Claus will visit. A holiday reception follows the dedication. 5 p.m. “Ally Skills Workshop: Combatting Sexism and Transphobia.” Free training to “helping people recognize sexist or transphobic patterns, develop language to call out casual sexism and transphobia, and respond to uncomfortable situations.” At Jackson Mann Community Center, 500 Cambridge St., Allston, Boston. 6:30 p.m. “Trump vs. Justice for Palestine.” Jewish Voice for Peace Boston meets to “discuss the post-election future of Jewish community organizing for Palestinian rights.” At the Democracy Center in Cambridge. 6 p.m. “APIs for Black Lives Direct Action/Support Meeting.” A meeting to discuss “direct action and support for black-led racial justice organizations in the Boston area.” At Asian American Resource Workshop, 42 Charles St., Dorchester. 6 p.m. “Sustainable Tourism on a Finite Planet.” Megan Epler Wood, director of Harvard’s International Sustainable Tourism Initiative and author of “Sustainable Tourism on a Finite Planet,” will discuss “reforms required to lower tourism’s impacts and protect the health of local populations, ecosystems, cultures, and monuments worldwide.” At Harvard’s Museum of Natural History in Cambridge. Free. 6 p.m. “Stand with Standing Rock – Providence Musicians and Yogis Unite.” An evening of “sound, yoga, dance and community” to support the pipeline protest. At Alchemy in Providence. 7 p.m. “BAGLY World AIDS Day Events.” The Boston Alliance of Gay Lesbian Bisexual Transgender Youth meets to hear “stories of People living with HIV and all come together and clear up the misconceptions of the reality of HIV.” At BAGLY, 14 Beacon St., Boston. 7:30 p.m. “Burren Annual Benefit For Somerville Homeless Coalition.” A night of music to support the coalition. At the Burren in Somerville. Midnight. “25th Medicine Wheel Vigil” at the Boston Center for the Arts, a 24-hour event to honor those affected by HIV/AIDS. 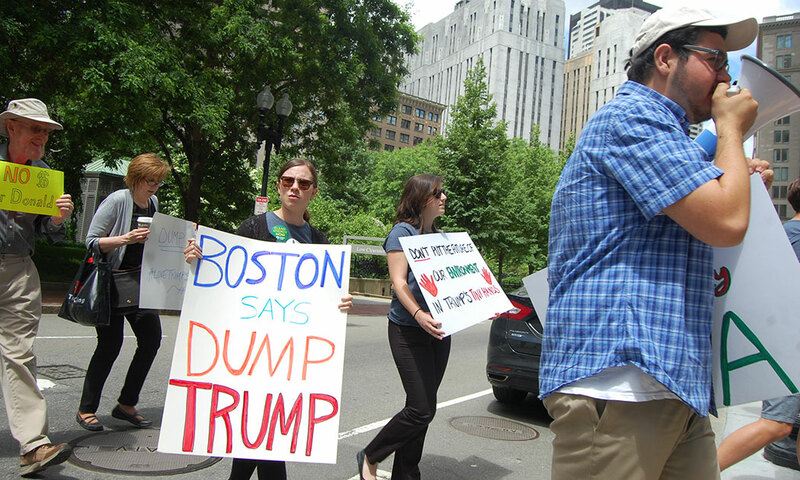 Pictured at top: Anti-Donald Trump rally at Boston’s Post Office Square on June 13, 2016. Copyright 2016 Greg Cook.